Koffler''s high quality Carpet Seaming Tapes and Carpet Welding and Seaming Iron help ensure a great carpet installation for today''s softer, temperature-sensitive carpets. The SeamMasterTM line of tapes offer a low melting point while providing a universal adhesive which bonds to all carpet backings. The TRAXX STIXXTM line of extra strong seaming tapes have almost 25% more fiberglass threads and deliver a low profile design for less visible seams than other tapes. The Carpet Welding and Seaming Iron is designed for seaming and welding today''s softer temperature-sensitive carpets; evenly spreading heat over the entire iron base while providing a low temperature swing. Carpet Welding and Seaming Iron evenly spreads heat over the iron base. It has a high quality thermostat, heavy-duty handle construction and large temperature setting dial. It has a heat shield that stays 7-10 degrees cooler than competitor irons and has a low temperature swing. Designed for seaming and welding softer, temperature-sensitive carpets. STIXXTM Knitted Tapes are designed nearly 25% more fiberglass threads providing additional strength. Their heat resistant cotton threads bind fiberglass threads together. STIXXTM Knitted Tapes have a low profile, thin filament that creates a less visible seam than other tapes. They do not stretch, shrink or pucker when too much heat is applied during installation. S-10 and S20 are designed for use with velvet, low profile, Jute, and ActionBac® carpets. The S-10 and S20 are recommended for light to medium residential foot traffic. The S-20 may also be used for light to medium commercial foot traffic. S-30, S50 and S-60 are designed for use with Jute, ActionBac®, Soft Bac®, Wovens, Axminster Wilton, and Berber carpets. S-40 is designed for use with Jute, ActionBac®, Soft Bac®, Wovens, and Axminster Wilton carpets. The SeamMaster™ line of tapes have a superior adhesive formulation that bonds well to all carpet backings while having a low melting point, making them great for today''s heat-sensitive carpets. SeamMaster™ Best Tapes have superior bond strength and are ideal for installations with heavy commercial or residential foot traffic. 11 beads of adhesive with X-tra wide center bead. Lifetime warranty. SeamMaster™ One Tape has superior bond strength and has a very low profile. It is ideal for installations with heavy commercial or residential foot traffic. 11 beads of adhesive with X-tra wide center bead. SeamMaster™ Smart Tape has great bond strength. It is ideal for installations with medium to heavy commercial or residential foot traffic. 9 beads of adhesive with X-tra wide center bead. SeamMaster™ Handy Tape has good bond strength. For residential installations with light to heavy foot traffic. 9 beads of adhesive. Gripper Stripper is a double stick tape that features a low profile flat paper that is peeled off after the seam is made. Ideal for custom area rugs, double-stick and glue-down installations, borders and fills. 3" Double Scrim Tape (S-93-F) is recommended for use with woven and Axminster-backed carpets in loose-lay installations. It is ideal for commercial foot traffic. 22 yards/roll. 6" Double Scrim Tape (S-95) has a 7" full width bonded with 6 inches of knitted scrim. It is recommended for heavy commercial or residential foot traffic. For jute, woven, Wilton, ActionBac®, and Axminster backed carpets. 22 yards/roll. 3" Double Scrim and Double Stick Tape (S-112F) has flat hot-melt on top and pressure-sensitive on the bottom. It is recommended for commercial foot traffic, double-stick applications of woven and Axminster-backed carpets. 22 yards/roll. 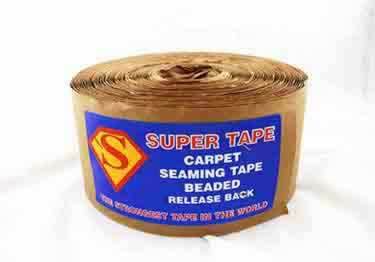 Super Tape is a 4" super strong beaded, release back, carpet seaming tape. 22 yards/roll. Seam Tape (PL-30) and Pro Tape (PT50) are 4" in width. 22 yards/roll. Koffler''s high quality Carpet Seaming Tapes and Carpet Welding and Seaming Iron help ensure a great carpet installation for today''s softer, temperature-sensitive carpets. The SeamMasterTM line of tapes offer a low melting point while providing a universal adhesive which bonds to all carpet backings. The large abrasive discs you need! 16" discs available in 12, 16, 20, 36, 50, & 80 grits. Abrasive discs sold individually.